What a week of top-level alpine racing at Sun Valley! 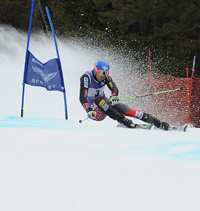 Hosted by Sun Valley Resort and the Sun Valley Ski Education Foundation, the International Ski Federation (FIS) Western Region Spring Series on Baldy wrapped up six days of racing Monday. SVSEF communications director Jody Zarkos said that 210 athletes made 1,051 unique starts on three Warm Springs race courses. The series showcased Baldy’s strengths, the talents of some of America’s rising alpine stars, and a strong organizing crew. Asked by Zarkos about the prospect of the SVSEF hosting the next year’s Spring Series, Gwynn Watkins, competition manager of the U.S. Ski and Snowboard Association Western Region, said a decision will be reached this May on the 2015 venue, but Sun Valley will be strongly considered. Two-time U.S. Olympian Resi Stiegler, 28, of Jackson Hole, Wyo. has battled through injuries throughout her U.S. Ski Team career—including a broken leg that kept the technical specialist out of the 2010 Vancouver Olympics. Yet Stiegler has enjoyed one of her healthiest seasons in 2013-14, and she capped it off by winning the final three women’s races at Sun Valley Saturday through Monday. Stiegler, the U.S. slalom silver medalist (both times the top American) at the last two national championships, powered to a 2.18-second victory in Saturday’s 57-gate slalom on Cozy and added 1.15-second and 0.54-second giant slalom wins Sunday and Monday on the Hemingway/Greyhawk course. Westminster (Utah) College sophomore Tonje Sekse, 22, the 2013 U.S. national slalom bronze medalist, captured Friday’s slalom. Anna Marno of Steamboat Springs, Co. took the super giant slalom wins Wednesday and Thursday. The five different men’s race winners at Sun Valley included 29-year-old Tim Jitloff of Reno, Nev., a back-to-back SG winner last Wednesday and Thursday, followed by Mark Engel and Jared Goldberg in giant slalom, and David Chodounsky and Will Gregorak in slalom. Engel, 23, of the University of Utah ski team, won Friday’s GS over Goldberg among 113 men, biggest event of the week. Goldberg, 22, a Boston native out of Holladay, Utah and the Snowbird Sports Education Foundation, took the Saturday GS. Olympian Goldberg was the 2013 U.S. national downhill champion who crested on the World Cup this season with a 12th in January’s Lauberhorn downhill at Wengen, Switz. Olympian Chodounsky, 29, a native Minnesotan out of Crested Butte, Co. and Dartmouth College, is the two-time defending U.S. slalom king who took Sunday’s Cozy slalom on a day when 78 of the 102 starters didn’t finish two runs. And Gregorak, 23, of Vail prevailed in Monday’s slalom. Univ. of Utah’s Teagen Palmer (3-SL, 11th overall and 8-GS, 16th overall), Middlebury College’s Nicole Roos (3-SL, 13th overall, plus 10-SL and 15-GS), and Rocky Mountain College’s Harlan Collins (9-SL, 24th overall and 15-GS, 34th overall). The Squaw Valley (Ca.) Ski Team boasted the winners of the overall championships in the junior category with Madeline Johnson, 18, and Erik Arvidsson, 17. U-21s Tanner Farrow, 20, and Kipling Weisel, 19, of the SVSEF Gold Team, along with U-18s Haley Cutler and Samantha Busby, led the way for the contingent of 24 SVSEF racers testing the waters at the Spring Series. Farrow cracked the top 10 in all four of his races, winning his class twice in GS (best 5th overall) and placing second in SG twice. Farrow was a Nor-Am and European Cup competitor who also raced in the 2014 FIS Junior World Championships Feb. 26-March 5 in Slovakia. USST hopeful Weisel has showed remarkable consistency in all disciplines during his racing career and the Spring Series was no exception. He improved each day on Baldy—10-SG and 5-SG (21st and 13th overall), 2-GS and 3-GS (10th and 9th overall), and 2-SL and 1-SL (5th and 7th overall). Cutler, turning 17 April 8, finished high in her U-18 class in all six of her races. They were 3-SG and 4-SG (7th and 7th overall), 12-SL and 15-SL, 12-GS and 13-GS (36th and 31st overall). Busby, 16, claimed both junior and women’s championships in giant slalom for the series. She finished all six races—5-SG and 5-SG (10th and 11th overall), 23-SL and 18-SL, 1-GS and 4-GS (9th and 10th overall). Most of the SVSEF athletes agreed that it was a unique experience to race on their home hill against a field that featured 17 members of the U.S. Ski Team and nine Olympians from the 2014 Winter Games, according to Zarkos. U-21 women: Linnea Baysinger 4-SG, 3-SG (12th overall), 17-SL, 11-SL, 22-GS, 16-GS; Mackenzie Bachmeier 7-SL, 4-SL (16th overall), 5-GS (12th overall) and 6-GS; Karina Schwartznau 5-SG (18th overall) and 5-SG, 16-SL, 20-GS, 13-GS; and Amanda Stelling 9-SL (23rd), 8-SL, 19-GS, 17-GS. U-21 men: KJ Savaria 11-SG, 13-SG, 7-SL (20th overall); and Ben Kanellitsas 27-SG, 10-GS (28th overall), 22-GS, 10-SL. U-18 women: Madison Milgard 18-SG, 20-SG, 31-SL, 22-SL, 23-GS, 18-GS; Olivia Wentzell 27-SG, 32-SG, 19-SL, 33-GS, 26-GS; and Jordan Fitzgerald 19-GS. U-18 men: Tanner Josey 13-SG, 8-GS, 11-GS; Austin Savaria 15-SG, 11-GS; Taylor Cooper 16-SG, 9-GS, 10-GS; Emmett Say 20-SG, 22-SG, 6-SL (22nd overall); Stockton Troyer 21-SG, 24-SG, 10-GS, 14-GS; Griffin Curtis 23-SG, 20-SG, 20-GS, 22-GS; Jay Fitzgerald 24-SG, 18-SG, 14-GS, 8-GS; Montana Kurahara 25-SG, 23-SG, 18-GS; Hunter Kern 26-SG, 25-SG; Payton Anderson 12-SL; and Trenor Gould 21-GS.